So why not at least have some fun with it? 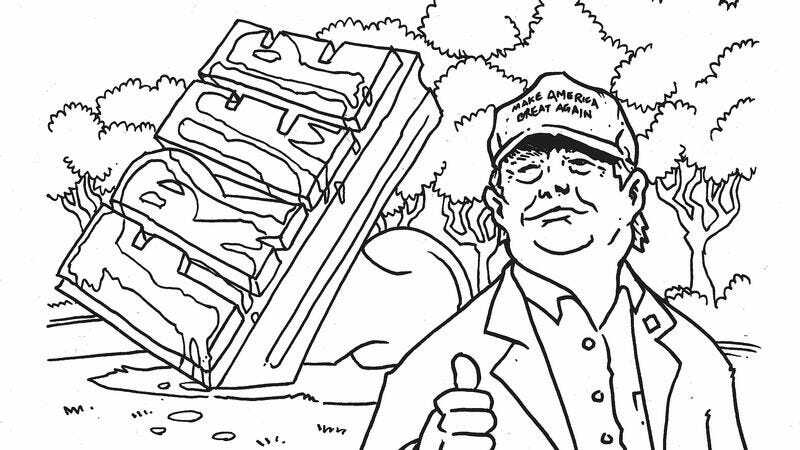 Scene has commissioned a special RNC coloring book just for the convention. The reasoning behind this project seems to be that the level of discourse in this election is on par with schoolyard bullying. Trump in particular has brought playground name-calling to the national stage, devising catchy nicknames (“Lyin’ Ted,” “Little Marco,” “Crooked Hillary,” etc.) for his opponents. If the candidates are going to behave in a childish, regressive manner, then maybe the literature about this campaign should be just as juvenile. But there’s plenty of abuse to go around here, not all of it aimed Trump’s way. In one illustration, for instance, the phenomenally unappealing Ted Cruz tries to ingratiate himself to some horrified young people who are not fooled by his sleeveless T-shirt or Doc Martens for one second. They react to him as if he were the monster in some old Universal horror film. Chris Christie’s portrait, meanwhile, evokes his reputation-ruining “Bridgegate” scandal as well as his love of comically large sandwiches.